Even if you are not an architecture buff (and I am not), unique and one-of-a-kind architectural structures are curious and inspiring. The work of Austrian artist and architect, Friedensreich Hundertwasser, reconciled humans with nature, while other architects focus on whimsy, fantasy, modernity, and conceptual consumerism in their work. With the rise of more adventurous travelers – those who seek experiences well outside the bounds of a predetermined tour – uncommon hotels and guest houses have popped up in all corners of the world. Ice structures, mirrored cubes, salt palaces, wine casks, isolated caves, art installations, deserted prisons and everything in between – accommodations need not be ordinary. Land, sea and air offer abundant choices for the adventurous traveler. Take a look at seven unique places where hanging out is as much a part of the travel experience as venturing out. If earthbound isn’t your style, you can hang in a sphere in the forest. Commune with nature without actually roughing it. 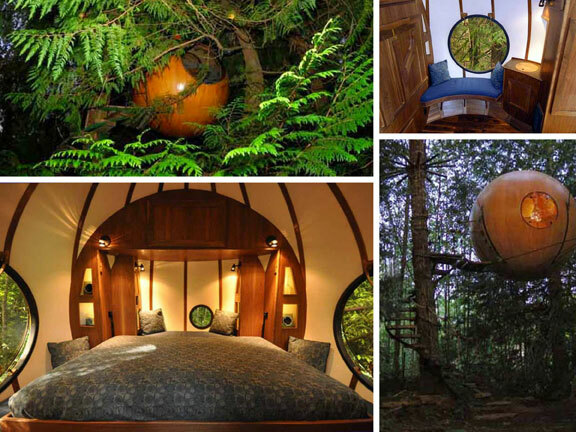 Set among the tall trees of the west coast rainforest of Vancouver Island, Canada, the orbs are tree houses for adults. Built with a clear vision and cleverly engineered, the handcrafted spheres are suspended like pendants from a web of rope. They sway gently in the breeze, or move as weight shifts from within. Currently there are three orbs. Eve, Eryn and the newest sphere Melody, house from one to three people (varies by sphere). Open year round, each sphere contains a standard power connection, towels, bedding, hot showers and a sauna, and a heater in colder weather. Over in Cottonwood, Idaho, being in the doghouse is a good thing. 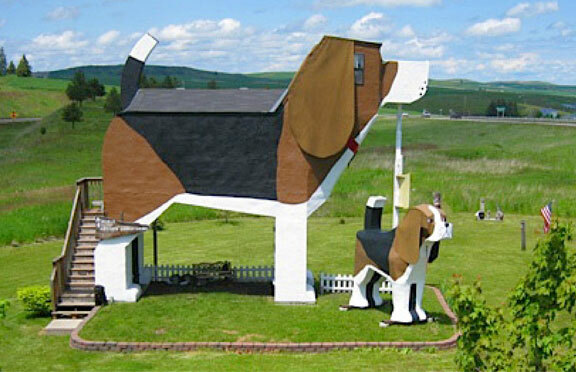 At Dog Bark Park Inn Bed & Breakfast, sleep inside the world’s biggest beagle with all the comforts of home. It’s a dog outside. Inside – a charming escape from the ordinary with carved dogs and dog-shaped cookies everywhere. Dog Bark Park is home to Toby and Sweet Willy, the world’s biggest beagles. Toby is a 12-foot tall statue. Sweet Willy, home of the Inn, is one of America’s latest additions to the roadside architecture popular in bygone days – with all the comforts of modern days. Enjoy prairie views and starry nights, history and culture, horseback riding, or explore Idaho’s vast landscape. Life above ground too boring? 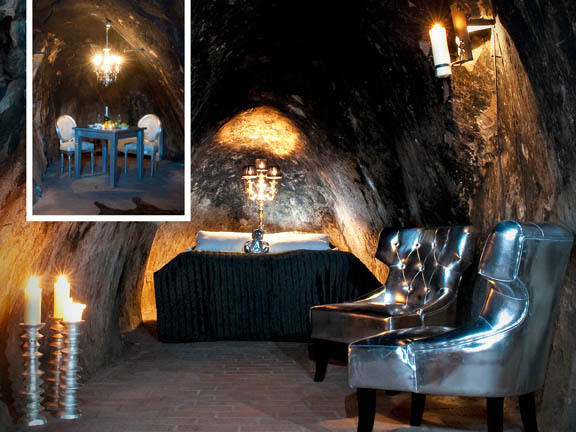 How about sleeping 500+ feet below ground – in a converted silver mine. The Mine Suite is surrounded by winding galleries and cavities. After the mine tour, you begin your stay with a basket filled with cheese, biscuits, fruits, wine and chocolate. As the guide leaves you to enjoy your overnight, you enjoy the quiet of the mine. In the morning a guide comes to serve your breakfast, and then it’s back to ground level again. Wear warm clothing for your stay and tour. It is only 35° F (2° C) in the mine year round. The suite, however, is kept at a toasty 65° F (18° C) with a comforter and lots of extra blankets. There’s a toilet, but showers are taken above ground. Communicate with the ground level staff via intercom. It’s too deep for your mobile. For earthbound fantasy fans, this Belgian favorite is a one-of-a-kind world. There are 10 lavishly-furnished and decorated bedrooms that are interpreted from international fairy tales. The resort is comprised of unique rooms – from a spaceship in a lunar landscape to a troll’s habitat complete with running stream and goldfish. You can also relax inside a Trojan horse or even sleep with a mermaid. This extraordinary property was designed and built by architect/visionary hotelier Dominique Noël and the rooms highlight his incredible imagination. The remarkable attention to detail houses natural materials and focuses on the simplicity of modernity, with an accent towards fun. Noël’s innovative restaurant, La Gargouille (the Gargoyle) is located conveniently next door. 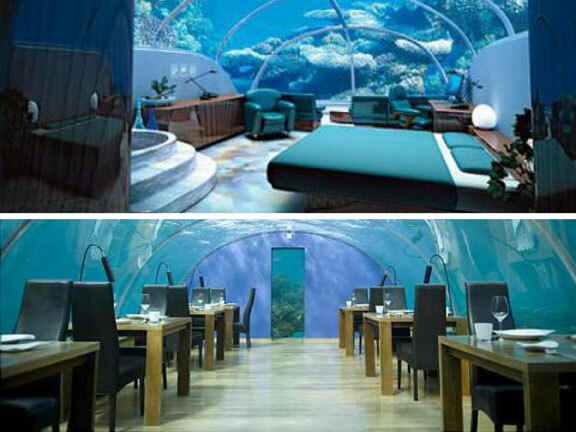 Welcome to the only underwater hotel in the world. Note that land lovers need not apply. To enter Jules’ Undersea Lodge, you have to be a certified scuba diver. That’s right, dive 21’ down through the Emerald Lagoon. This structure – similar to an underwater terrarium – was the former home of La Chalupa Research Laboratory, an underwater habitat used to explore the continental shelf off the coast of Puerto Rico. Converted with all the creature comforts of land hotels, including WiFi, Jules’ is the ultimate adventure for those looking for experiences off-the-beaten. The mangrove lagoon where Jules’ is situated is a natural nursery area for tropical angelfish, parrotfish, barracuda, and snappers, while anemones, sponges, and oysters cover the exterior skin. The Lodge serves as an artificial reef – providing shelter and substrate for marine animals. If sleeping inside a beagle isn’t grand enough, you can sleep inside a 40’ elephant. Kumbuk River Resort is a 16-acre oasis nestled in Buttala, Sri Lanka. Its massive two-story primary villa is in the shape of an elephant. 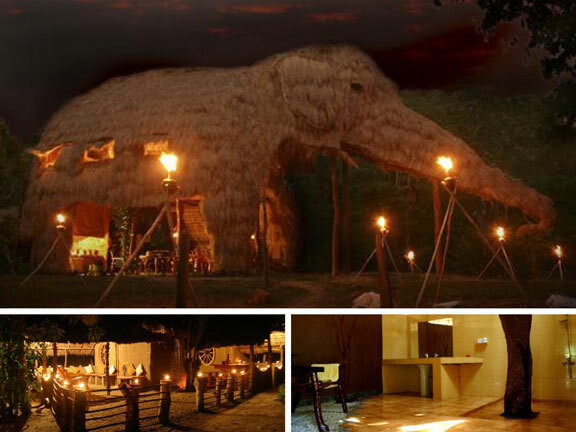 The eco-lodge is situated on the banks of the river near Yala, Sri Lanka’s premier wildlife sanctuary. Sleep in the elephant’s belly or in one of the two other chalets which house larger groups. Guests are capped at 12 persons to maintain high standards in an eco-friendly environment. In its beautiful surroundings, amidst the river and its unique facilities, visitors are invited to become one with nature. The lodge is designed for visitors to enjoy a unique holiday experience without the environment-damaging facets of life in the city. There’s always more. 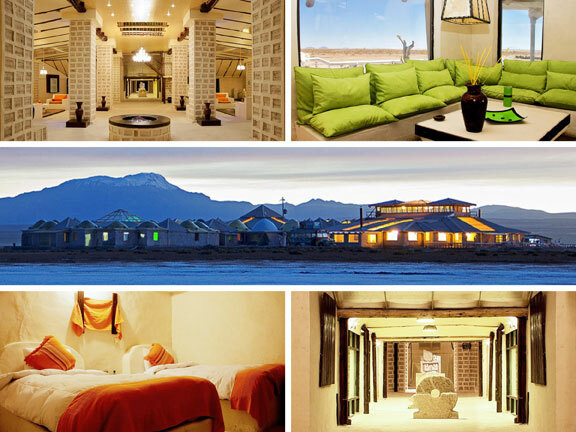 Set in the gorgeously surreal landscape of Bolivia’s Salar de Uyuni salt flat, sits Palacio de Sal Hotel & Spa, a luxury hotel made entirely of salt. Yes, salt. Walls, floors and ceilings, all salt. Much of its decoration is made of salt too: Chairs, tables, beds, and sculptures making the Palacio de Sal one of the most unique places in the world. It took two years to construct the breathtaking structure, while extracting the nearly 1 million bricks directly from the salt flats. The nearly 48,000 square-foot hotel has 16 rooms, resembling igloos, and a golf course. And the basis of the meals? Salt of course, including their specialty chicken salt. Where would you plan your holiday? 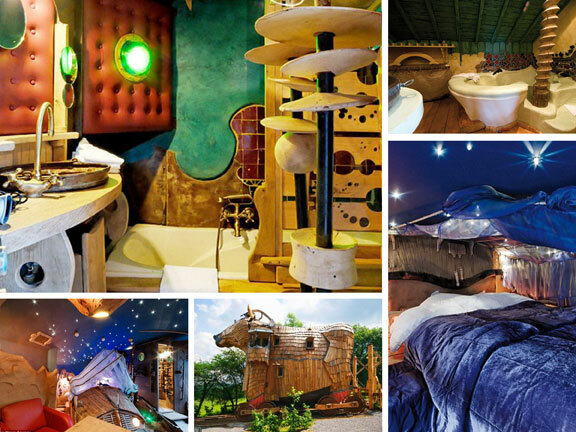 Check out seven more unique accommodations here. Images: Sala Silvermine/Pappilabild; La Balade/Caters News Agency. All other images © of the individual hotels/guesthouses. This entry was posted Monday, September 9th, 2013 at 7:17 am	and is filed under art, just curious, travel. You can leave a response, or trackback from your own site.